Fifty-five years ago, Billy Graham and his team accepted the invitation to build an evangelistic pavilion — strategically placed only a few paces from the main entrance to The New York Worlds Fairgrounds. The Billy Graham Pavilion, located on a 50,000 sq. ft. plot of ground, housed a 100-foot pavilion tower, a display area, a 400-seat theater, offices, and counseling rooms. In the theater, they would run the World Wide Picture film “Man in the 5th Dimension” 12 hours a day, 7 days a week. Watch the classic newsreel above for more messages from Billy Graham, behind-the-scenes footage of the pavilion being built, and footage from the fair. 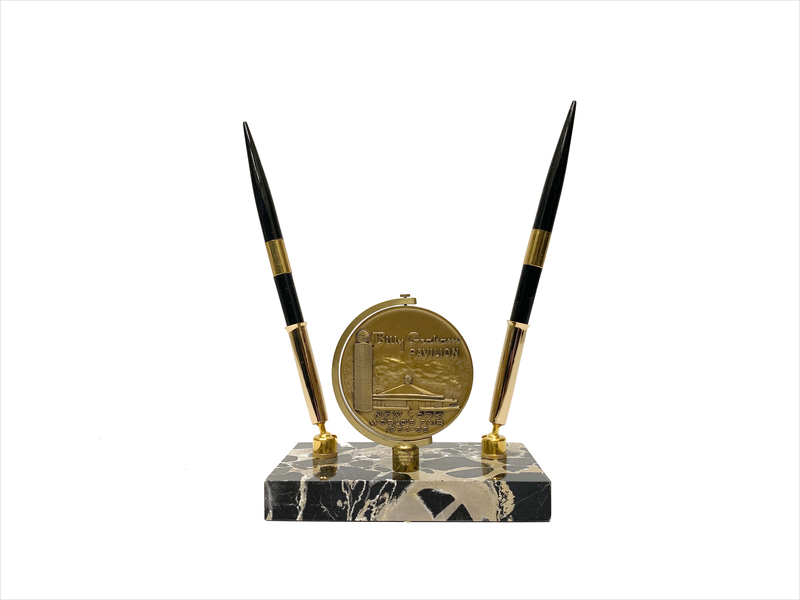 Below, you can see our featured archive from this event: a set of two marble pens along with a pen holder and medal honoring the Billy Graham Pavilion. See more archive items from the Billy Graham Library.